I moved into a new home back in December 2012. Since then, I have been working out in my basement with the space I have. 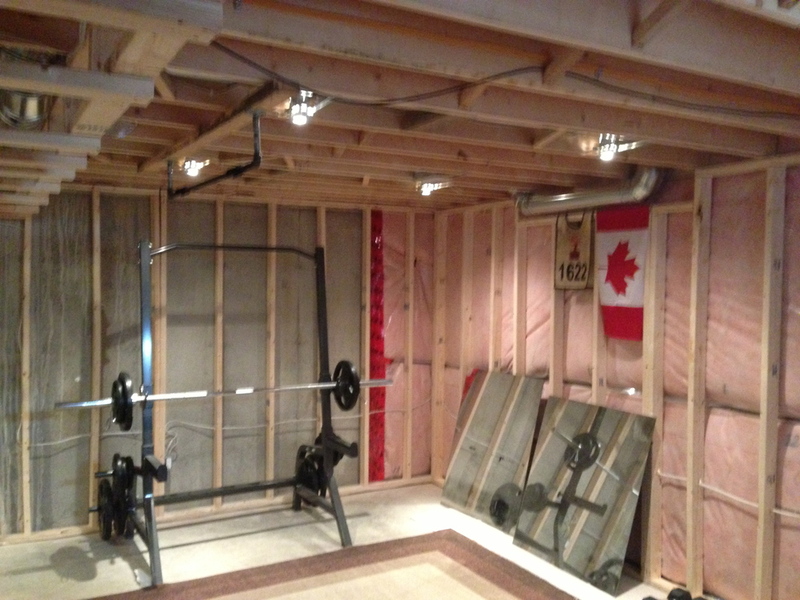 I finally got the green light from my wife to finish our basement, and majority of the room we have can be used as my home gym. I have helped my dad finish basements in the past, but this is the first one I have done on my own, so I have definitely made some mistakes and rookie goofs along the way. I plan on finishing the mudding/sanding/painting of the gym in 2014. Earlier this year, prior to framing, I finally purchased my squat rack. Framing done, hired an electrician to get everything safe and to code. Pot lights installed by me. Drywalling started, I did (nearly) all of it on my own. Had to build some T's to help with the ceiling. Drywalling done, time to get rid of the carpet flooring. Went and picked up my rubber tiles in my 4-door Honda Civic...a bit of a tight fit but it worked!